All elegance is subtle, and subtlety is the path that the creators from Cuschieri Design have decided to take when planning out the construction of Crema Espresso in Brisbane, Australia. The light and airy kiosk is a far cry from the rather melancholy coffee shops that create an intimate feel through the manipulation of dark tones and shadows. Open and inviting, Crema Espresso uses delicate touches to attract a more solar clientele, used to open spaces and a sunny location. The sophisticated design came as a response to what its creators suspected that the profile of the potential customers would be. 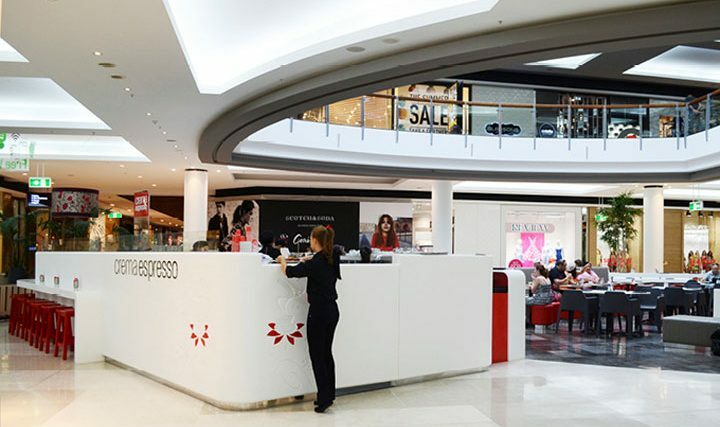 Located in the high fashion area of the Westfield Carindale shopping center, the kiosk needed to replicate the style and subdued elegance of the likely client who, walking to and from a Chanel store, needs a short break and some refreshments before going back to shopping. The kiosk also needed to look the part in an area where elegance is the word of the day. The designers chose white as the basis for the chromatic palette, balanced with charcoal pieces and splashes of vibrant red for contrast. 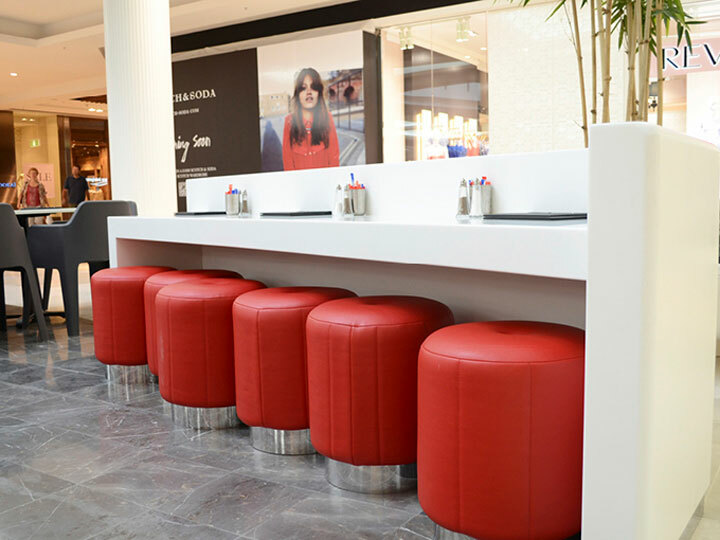 Surrounding the kiosk, a white wall flows in delicate curves in one seamless structure and morphs into counters where customers can be seated. Designers used Staron as a material for the wall. 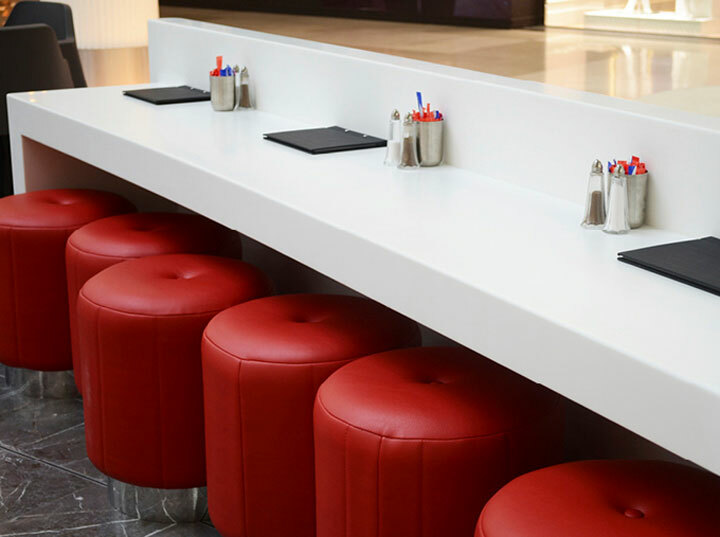 Staron can be easily thermoformed to achieve seamless shapes, while its non-porous surface keeps it safe from stains. 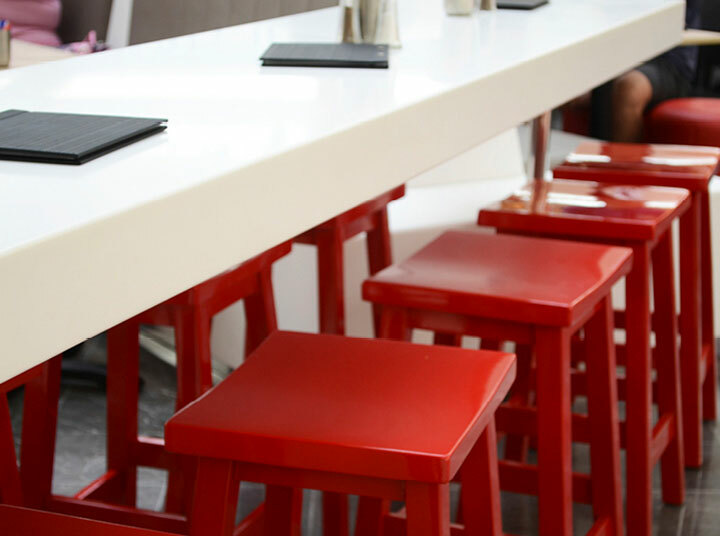 Playing on the same simple elegance, red chairs are paired with upholstered stools to create an uncrowded seating area along the counter. The same red is used as a slight touch of color in the coffee cup graphics debossed on the side of the wall. 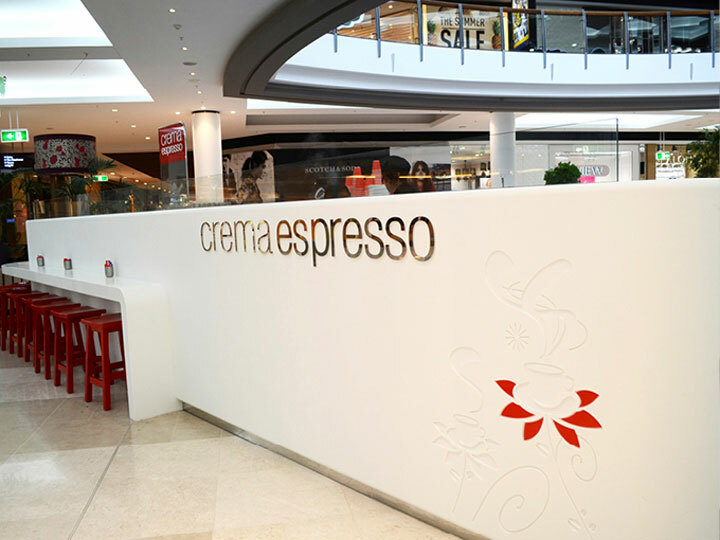 Written with stainless steel letters on this white background, the name of the Crema Espresso kiosk looks like the symbol itself of refinement and style.